I just baked apple crisp inside an apple. I had a serious apple craving. I almost called it breakfast, but then the ice cream came to the party. 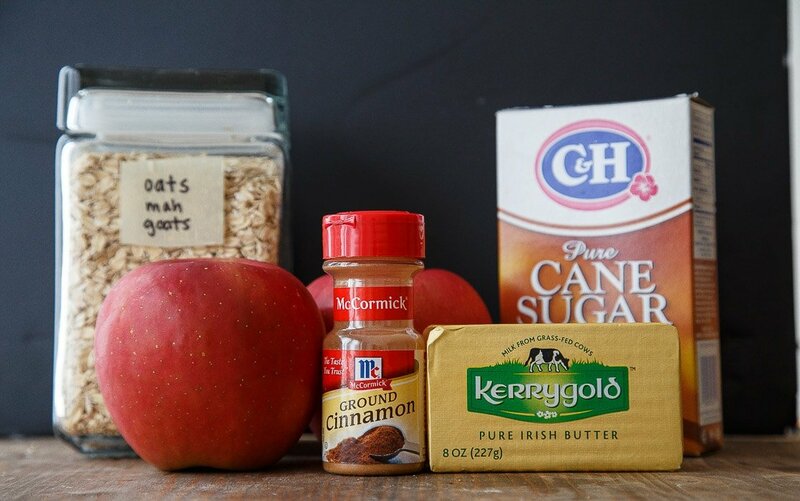 This recipe makes two apple crisps (for two!! ), but feel free to scale this recipe up and serve an entire tray of individual apple crisps at your next fall party. I’ve been baking with fancy butter a lot lately. I figure I’m worth it. But also, I found a 3-pack of Kerrygold at Costco for the same price as one bar at the regular store. I put two in my cart. Then, I walked a lap around the store, ate samples at three different stations, listened to a Vitamix sales pitch, and grabbed two more packs of butter. Costco got me–hook, line, and sinker. Normally, I use store-brand ingredients for my recipes because I think that’s what everyone else uses, and I want to know exactly how a recipe will taste to you. But I just can’t resist the fancy gold butter. I also used it in my apple cider caramels, fyi. If you leave off the ice cream, you can absolutely call this breakfast. But, I just want to remind you that ice cream has calcium and protein. Vital stuff; a great way to start the day. Peel, core and dice one apple. Place it in a small skillet with 1 teaspoon of the cinnamon, lemon juice, 1/4 cup of the brown sugar, and 1 tablespoon of the butter. Turn the heat to medium high, stir, and cook until the apple start to soften and release their juices, about 5 minutes. Turn off the heat, and then stir in 2 tablespoon of the flour until dissolved. Let cool. Meanwhile, slice the tops off the remaining two apples, and core them, but do not go all the way through the bottom. Remove most of the inside of the apple, but leave enough intact so that the apple still stands up on its own. Stop about 1" above the bottom of the apple. Fill the apples with the cooled apple mixture. In a separate bowl, stir together the remaining cinnamon, brown sugar, butter, oats and flour. Pinch the butter into the mixture to form a crumble. Divide the mixture between the two apples and pack it firmly on top. Place the apples in a small baking dish, add a splash of water to the bottom to prevent sticking, and bake for 25-30 minutes. Serve warm with ice cream. What a great (and yummy!) idea! I JUST baked cheesecake in an apple! It’s perfect because 1. You can eat the bowl. 2. That means less dishes to wash. SUCCESS. And, I totally approve of this for breakfast. Acceptable. Pinned! Can I admit that I’ve never tried fancy butter? I basically use Giant brand… Is there a serious noticeable difference? Regardless, I adore these! They are adorable! Kerrygold butter is like a food in and of itself! Love love the double apple biz you have going here lady. What a fun recipe. I don’t think I’ve made baked apples before? Crazy right? My kids would love this. 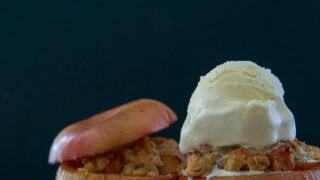 These apple crisps look divine and honestly isn’t ice cream a perfectly acceptable breakfast food? Either way I say it’s a win. These would make a fine breakfast! lol I have not tried the Kerrygold butter, but I do routinely buy my butter at costco. just cant beat the price. 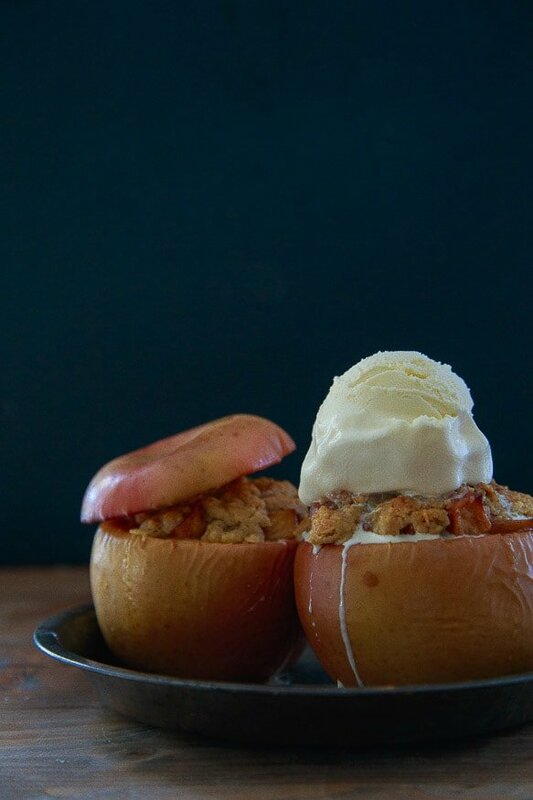 This is one of those perfect weeknight desserts where yo get all cozy in your PJs, bake in your kitchen, and wind up on your couch with a gorgeous apple crispy in your lap! 3 packs for the price of one?? Oh count me in! We are finally getting a Costco in Upstate and I can’t wait. This apple crisp is just genius! Costco always gets me (as does Target and Trader Joe’s, but that’s beside the point). And yes to ice cream for breakfast! Ice cream is basically milk and milk goes in cereal and this is an apple bowl and it really all feels like breakfast food to me. I’m in. I’ve been meaning to bake something in an apple for a while but still haven’t had the chance! These apple crisps are too cute and sound so delicious! yummmmmm — and that melting ice cream is calling out to me!! “Oats mah goats” BUHAHAHA! Love it. Also, these look delicious! I’m a teeny bit obsessed with apples this fall season. where do the oats come in? I vote YES for breakfast! This would also be a special, rustic dessert for a “pasture party” in the fall. Fun idea Christina! Yeah, now I have an excuse to eat ice cream for bfast! Who says you can’t have ice cream for breakfast? It’s made with milk, right? ;) Looks amazing…nothing better than apple and spices baking in your oven to make your home feel cozy on a cool Fall day! This looks gorgeous, Christina! Love it. What a clever idea. And a most delicious one too—-all warm and yummy with melty vanilla ice cream. Out of sight! What a genius idea! They’re literally oozing deliciousness. Can’t tell you how much I want this right now. You just created my DREAM! Your comment there at the end totally reminded of the old Bill Cosby skit where his kids wanted to eat chocolate cake for breakfast. So he mentally goes through the ingredients – wheat, eggs, milk – and decides it totally makes an acceptable breakfast. To which I agree 100%. Hi Christina, I am happy life is treating you so well. I enjoy seeing all of your postings! Apple Crisp is one of my favorite desserts. I have a question. 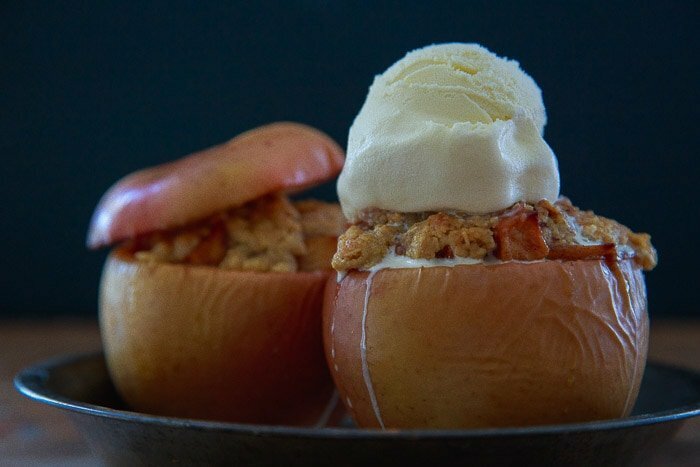 Which type of apple would you recommend for this recipe? I was always told that the Granny Smith apples are the best ones to use for baking, or is it just based on personal preference? This looks so good! It reminds me of stuffed peppers, but with apples in dessert form! Oh my word, love this! Wow! Wrap that baby in pastry dough and you’d have an apple crisp inside of a baked apple, apple dumpling! I love your idea of really going all apples on us! It’s fall after all!